I know, I know its not quite Fall just yet, but we have been ready for this season, like we are every year. This year I am embracing every color autumn is and offers every where else but Southern California. 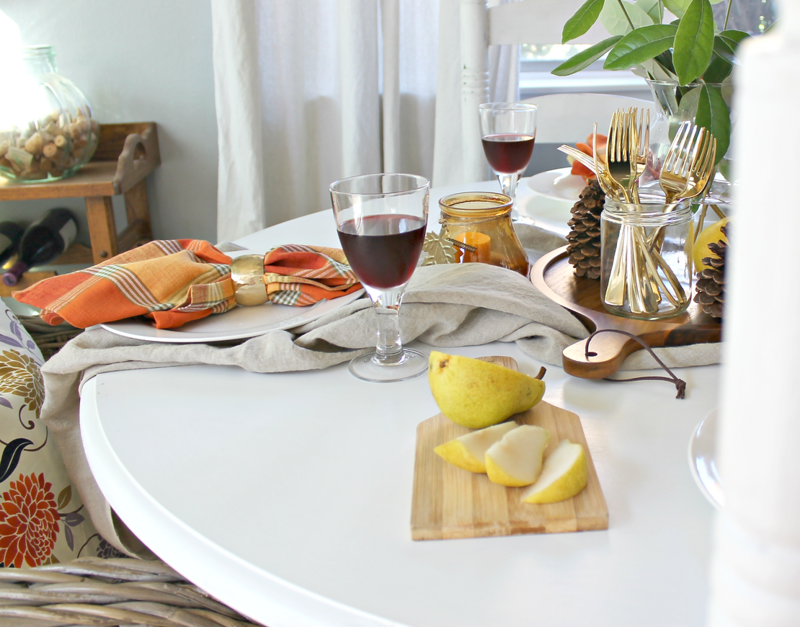 Including natural elements, as I love adding to almost every season's tablescape. I chose my items pretty carefully and slowly this year also. I kept both of these tablescapes that I'm about to share minimal, like I do most. You also probably noticed that a few furnishings and decor changed in our dining room space. I wanted to minimize and simplify. Our dining room table has been replaced with a smaller one and a few copper molding pans have been added to the wall decor. I'll be sharing more about the new [old] dining table very soon. Promise. For this first tablescape, the inspiration came from the pillow covers on the dining wicker chairs, you'll get a glimpse of them throughout the post. I actually found them on Amazon on accident, but instantly fell in love with all the colors. Normally this is too much colors for me, but this year I really wanted to step out of my comfort zone and these colors just really inspired me this year. I love that as home design lovers, our taste and inspiration changes and evolves from time to time. After the pillow covers everything else just kind of fell into place. I don't like to set up a table too perfectly, informal is more my style because I don't want it to feel untouchable or uncomfortable or too perfect. I want it to feel welcoming and one that has elements that can be moved around at any time if needed. I love a beautifully style table don't get me wrong, but this is just more me. Laying out a scarf, throw or blanket or table runner in the middle of a table makes a big impact and once you add simple items to the center like above, you'll start to see something come together and you can move them around freely until you are happy with the outcome. A cheese platter or cutting board, vase with greenery or flowers, candles, fruit, etc. Finished off this table setting with white plates, cloth napkins and metal rings, that I found at Target on clearance. It kept it informal by adding the utensils in a glass jar as part of the centerpiece. 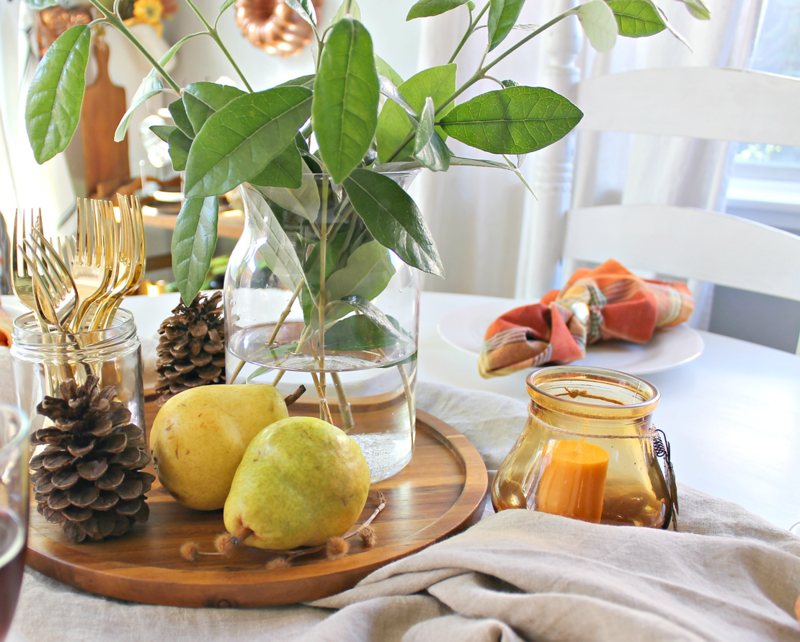 Pears are a favorite of mine as you know by now, last year I used them in my tablescape as well. In this setting I even wanted to include these red wine glasses from IKEA and even poured the wine so you could get a sense of what a festive feel this table already has, with just a few simple yet elegant elements. The amber votive candle holders and pumpkin votive, were a bargain find at my local Dollartree store. I instantly knew I wanted to add those to our decor this year somehow and they just so happened to look great on the dining table, small and not too over stated. This view makes me love this new [old] dining table even more. This second tablescape isn't too different from the first, but it's an even simpler one. Actually I probably love it more than the first, so you might too. I chose to give it a more eclectic look with vintage pumpkin love. And I wanted this to be more of a buffet style tablescape, so I skipped the utensils all together. This tablescape had me at pumpkin. I simply removed the napkin rings, placed the napkins under the plates and a pumpkin on the plates instead. I debated on changing out the plates and going out to buy new ones all together for a more dramatic feel, but I'm a sucker for a classic white plate. I love how both of these tablescapes came together, I don't always put too much thought into my table settings. I honestly already had most of the items on hand, except the only few things I did purchase this year, were the pillow covers, cloth napkins, tablecloth, and wooden cheese serving board. The reason I chose to buy these things is because they were reasonably priced and items I will use again and again. 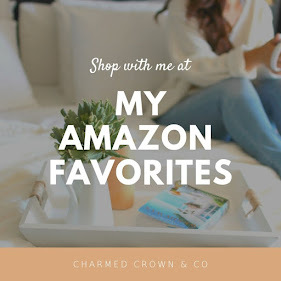 Pier1 Imports and Target are two stores that often times have quality items on clearance, so I tend to look there occasionally most often especially during holiday sales. Hope you find them inspiring and helps you decide on your elements just a little easier for your next Fall tablescape whether your having a Harvest dinner party or a friends-giving, this time of year gives you all the reasons to entertain.